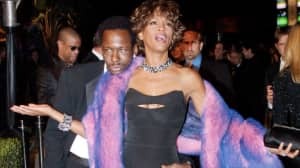 The trailer for Kevin Macdonald's documentary about Whitney Houston, titled Whitney, has arrived. The clip portrays the movie as an in-depth look at the life and career of the iconic singer, who died in 2012. The film features interviews from her friends, family, and management, as well as behind the scenes footage of Houston rehearsing, resting, and sharing thoughts about Paula Abdul. Watch the full trailer above. Whitney premieres on Wednesday night at Cannes Film Festival, and will hit U.S. theaters July 6.